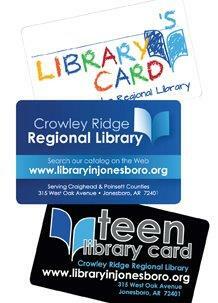 Residents of Craighead and Poinsett counties (with the exception of residents living within the Trumann city limits) may get a Crowley Ridge Regional Library Card. This card can be used at any of the libraries in our region: Jonesboro, Caraway, Monette, Lake City, Harrisburg, Marked Tree, Weiner and Lepanto. If you live outside our service area or within Trumann city limites, you may be eligible for a card through the Gateway Project, a collection-sharing program that provides free library services to Northeast Arkansas residents who live in ceratin counties. To qualify for Gateway access, you must have a card and be in good standing with your local library. Visit the library and talk to a staff member for more information about getting a Gateway Card. Those age 18 and older wishing to sign up for a library card at the library or at a library event in the community must present either 1) a photo ID that includes a current address, or 2) a photo ID with an incorrect or no listed address and an alternate confirmation of address. example: a driver's license, passport or school ID card. mail with a current postmark, utility bill, or lease agreement). The library will issue a plastic wallet-sized card and a plastic keychain card and will set a PIN that allows the cardholder to access online services. Parents or guardians wishing to obtain a library card for a child under 18 must either sign the child up at the library or fill out a library card sign-up form under special circumstances. The parent must have a photo ID and a local address. The listed parent or guardian is resonsible for their child's material selection and usage. For more information on getting a library card and patron responsibilities, please see our Library Card Eligibility and Cardholder Responsibilities policy.